All in for Dasha squared! Daria Gavrilova and Daria Kasatkina will play each other for just the second time on the WTA tour in one of Thursday’s most intriguing third round matches in Charleston. In yet another three setter between Kasatkina and Monica Puig, the Russian player scored a noteworthy second round win, 6-0 6-7(3) 6-2. For a time it looked like that wouldn’t be the case as Kasatkina led 6-0 2-0* 30-30*. Puig mounted a sizeable comeback to win the second set and force a decider as Kasatkina’s confidence waned. After an early exchange of breaks in the third set, Puig had two break points at 2-2 – Kasatkina held on and then powered home, winning the last four games of the match. Puig double faulted down break point at 2-3 and Kasatkina found some big serves to consolidate the break. Kasatkina broke again for the win on her fourth match point. It was nice to see Kasatkina playing a bit more freely in the decider although she did receive quite a bit of help from Puig at the end. Considering her recent form, it was a huge win for Kasatkina who is settling in for the clay court season. From 1-3 down in the first set, Gavrilova won 11 of the last 12 games to comfortably see off Alison Riske, 6-3 6-1. Riske had some joy early on, playing aggressively and coming forward as there was a minor question mark around the strapping on Gavrilova’s leg. However, with increasing variation and creating killer angles, Gavrilova became more assured as the match wore on. By the end of the match, Gavrilova was bossing the play with some unusually aggressive tennis. Gavrilova finished the match with superb stats, hitting 29 winners to 15 unforced errors.
.@DKasatkina advances to the @VolvoCarOpen Round of 16! Head-to-head record: In their only previous match, Kasatkina defeated Gavrilova in the first round of the US Open in 2015, 6-2 4-6 7-5. Kasatkina got into the main draw as a lucky loser after Sharapova withdrew. Interesting stat: Kasatkina will be aiming to win three matches at a tournament for the first time in 2017 (last achieved in Wuhan last year), while Gavrilova is seeking back-to-back wins for the first time since the Australian Open. 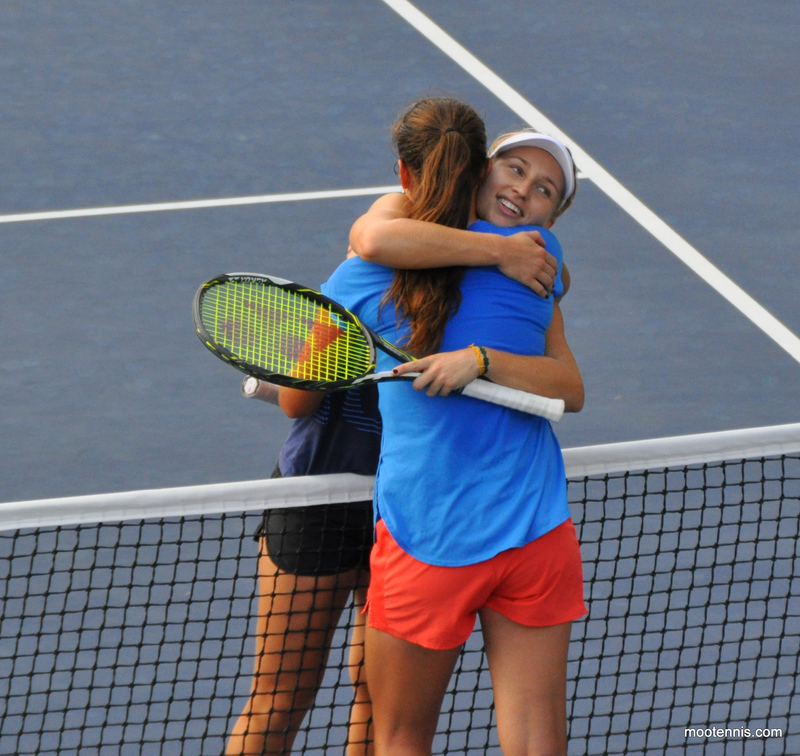 April 5, 2017 in Charleston, Gavrilova, Kasatkina, WTA. ← Tuesday’s Set Points, WTA Charleston Day 2: Rogers survives Cepede Royg, Team Bucie to clash in R2! Kasatkina was magic in set 1 against Puig. Not so much after that… Her and Dasha being friends concerns me about this matchup. I think both ladies could find it difficult really giving it to the other. I think Kasatkina may find it that bit harder. Yeah agree, it will be interesting. I’m glad it’s a bit later in the schedule so hopefully should be able to watch tonight. Who do you think is winning Monterey? Kerber? Pavs? I went for Pavs over Kerber in my draw before play got underway. I haven’t watched any matches from Monterrey this week so tough to judge for me. I saw Garcia was struggling in her first match but managed to turn it around. Yeah it was typically Garcia- she went 2 0 up, then lost 4 straight games and kept over pressing the return. I didn’t manage to watch her second round match. She looks pretty safe for a semi final spot. Not sure I fancy her chances against Pavlyuchenkova though.